Last week, equity markets suffered a “death by a thousand cuts.” The S&P 500 fell 0.9% while the Dow Jones Industrial Average dropped 1.2%. The Nasdaq Composite was the star of the week, only collapsing 0.4%. There was not one major headline that caused the retreat, but investor nervousness grew over concerns of Greece exiting the Euro zone, a pullback in Chinese shares and mixed domestic economic data. This week, all eyes will be on the jobs report as the guessing game surrounding rate hikes from the Federal Reserve continues. On Friday, the Commerce Department released its revised estimate for first quarter GDP growth. The economy retreated at a rate of 0.7%, well below the initial reading of 0.2% growth. This was still moderately better than the 1% decline expected by economists but represents the third quarter of contraction since mid-2009. As discussed many times over, the weakness was caused by what many believe to be transitory factors including weather, a stronger dollar and the shutdown of West Coast ports. It is worth noting that economic growth during the first quarter has been notably soft since the beginning of this recent expansion. Since mid-2009 there have been six calendar quarters that include the months of January to March. The average rate of growth over that time period is just 0.4%. 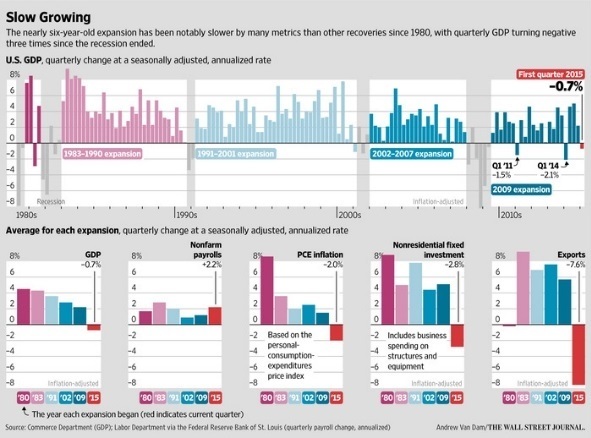 There are 17 periods for all other quarters where economic expansion averaged 2.8%. This difference is so pronounced that the San Francisco Federal Reserve bank recently published a paper discussing how a faulty seasonal adjustment artificially hampers first quarter estimates. Due to this, among other factors, many economists believe economic expansion will rebound in the second half of the year. A piece of evidence that confirms that the first quarter slowdown could be short lived is the durable goods orders reported last Tuesday. They fell 0.5% month-over-month in April, right in line with expectations. However, below the surface the data was much more impressive. Excluding aircraft orders, durable goods grew slightly better than expected at up 0.5% month-over-month. More importantly, core capital expenditures, a figure that excludes aircraft and defense related items, jumped 1% month-over-month or more than three times higher than expectations. This implies that economic growth should rebound after the dismal first quarter. A few notable housing statistics were released last week and they all pointed to continued momentum. New home sales in April were well above expectations showing a 6.8% month-over-month rise to an annual rate of 517,000 units. So far, we’ve averaged an annual rate above 500,000 units this year and if sustained, it will be the best year for new home sales since 2008. It’s worth noting this report was better than the existing home sales figure that came out a few weeks ago and that showed a 3.3% decline. Most people put more weight into that figure since new home sales only account for approximately 10% of total sales. However, it’s important to note the difference between how these are measured. New home sales are recorded at the time the contract is signed while existing home sales are counted at closing (which is typically a month or two later) so new home sales figures, while volatile and a much smaller percentage of the overall market, can be a better barometer of the current housing market given the time lag of existing home data. A recently improved market was confirmed later in the week when pending home sales (based on contract signings for existing homes) showed a 3.4% seasonally-adjusted increase. Additionally, values of homes continue to rise. The S&P/Case Shiller Home Price Index was released last week also. The seasonally-adjusted 20-city index showed a 5% year-over-year rise. Many of us can’t function in the morning without that first cup of coffee. We need caffeine to kick start the day. However, science tells us we should make that morning cup of joe a mid-day treat to optimize the buzz. Many of our body’s functions are determined by an internal clock known as the circadian rhythm. One of these functions is the release of the hormone cortisol, which determines our level of alertness among other things. The body begins releasing cortisol after rolling out of bed to wake the body up and levels tend to peak in most people between 8 am - 9 am. Interestingly, the effect of caffeine is diminished when there is more cortisol running through your veins, so drinking it immediately after waking up could lead to a higher tolerance and perhaps addiction since you get less of a buzz during periods of peak cortisol production. 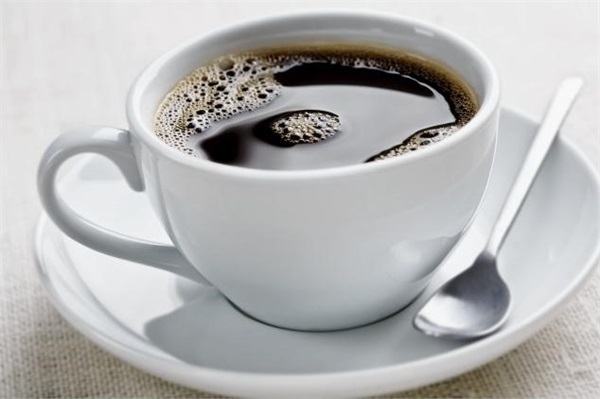 The bottom line: wait until after 9 am to drink coffee to maximize the caffeine buzz.